Remix is a segment of education content on MediaShift, featuring interesting and innovative journalism assignments, courses and curricula. Writers will detail their ideas and work and, where possible, provide links and materials, so other educators can adapt them in their own programs. If you’re interested in sharing your approaches to be remixed at other schools, contact education editor Aileen Gallagher. I transferred into full-time teaching after work as a digital strategist for the largest newspaper in the Mid-South. Much of the lessons I now teach were trainings I gave to our new hires in the areas of content marketing, SEO, SEM, and social marketing. The Meek School of Journalism and New Media at the University of Mississippi, which houses both the journalism and integrated marketing communication (IMC) programs, currently has the fastest growing program at the school. Much of this growth comes from a mixture of faculty with both academic and professional backgrounds. This project allowed students with no prior knowledge of search, video, app and display marketing be able to not only create and run those ads but also discuss strategies with clients. In my classroom, we work with Google’s online marketing platform AdWords because it has been the single most-referenced tool that helped former students land current jobs. Much of my first semester teaching was a week-by-week shift in topics for students to practice but not master. Over time, former students gave insight on the pieces of class that gave them the most leverage in gaining employment and what they desired to have covered more. What was once a two-week deep dive into AdWords has now grown to be the major project of the course. More than 100 students participate in the Google Online Marketing Challenge each semester. All students are also required to be certified in Google AdWords as part of the course. AdWords gives everyone from digital natives to experienced professionals the tools to learn, create and run search, display, video, mobile and app campaigns. AdWords is primarily used by two groups: advertising agencies on behalf of their clients or the businesses themselves. The platform allows a user to create search, display, app, video and mobile ads to run across Google-owned websites. For example, you could design an ad (image) and place it on Google’s Display Network. Google Display uses data to allow users to target ads based on age, interests, websites visited, location and more. Advertisers also place ads on apps, YouTube videos, or the mobile-based and text ads (SEM) that are found atop every page of Google search results. Google gives a step-by-step guide for any type of advertising you would want to run, plus countless YouTube tutorials to help. 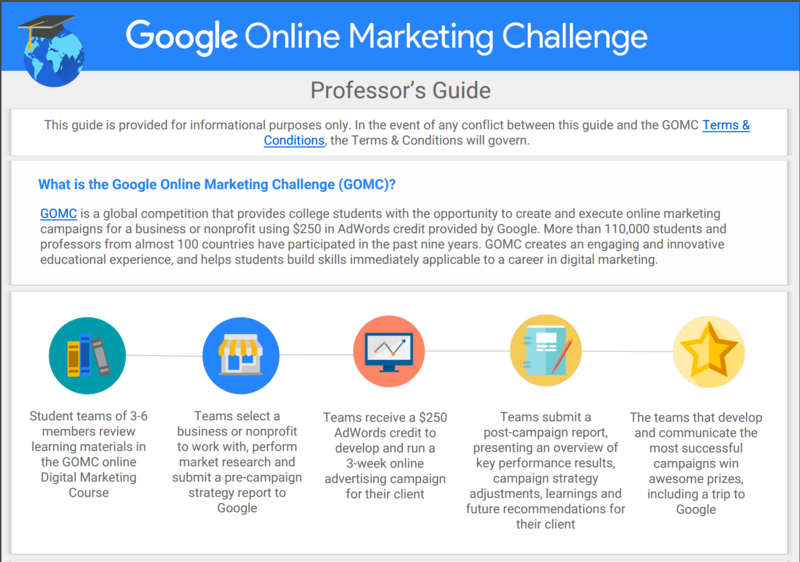 The Google Online Marketing Challenge is a way for college students to run real campaigns using a $250 credit from AdWords. Instructors can make a dummy student account to take screenshots of what students need to do to set up their teams and submit pre/post-campaign reports. Students can create Google Partners accounts to gain access to AdWords and Google Analytics training modules and certification tests. Students submit a pre-campaign report outlying the strategies and performance metrics they plan to use. Strategies may include bid types, budgets, and a sample of keywords to focus on. Performance metrics, on the other hand, would be KPIs, such as clicks, click-through rates, quality scores of keywords, cost per click and even Google analytics metrics such as conversions and bounce rates of visitors who came to the client’s website from the ads. After submitting their plan, students have 21 days to reach their goals. A post-campaign report details the methods they used and recommendations to their clients for the future. The challenge gives professors an assignment for students that is already laid out, with detailed instructions on writing reports and setting up campaigns. Some students noticed early on in their campaign that text-based ads weren’t working very well. To adjust, they added display ads (image ads) or opened up their locations to target more people (ads are shown to locations you select). Students who have had the most success in their campaigns usually have a well-defined audience and location, as well as a campaign that mirrors the company’s brand and website. If the company’s website includes tabs to specific products, students may create separate campaigns that focus on each tab in their website. This project allowed students with no prior knowledge of search, video, app and display marketing be able to not only create and run those ads but also discuss strategies with clients. By analyzing metrics, students uncovered opportunities to improve campaigns, create reports within the platform, and optimize their keywords for better overall performance. Students will submit their campaigns at the end of the semester to Google in hopes of winning the challenge against a worldwide competition. Though this is only the first semester-long project using AdWords, students are enthusiastic. They ad Google certifications to their resumes and have a project to discuss on job interviews. Some students have received interviews based on their knowledge of AdWords and one student received a job offer from an encounter with a marketing executive when she mentioned her project while on vacation. After the class concludes, the plan will be to track their progress and success using the tool as both an opportunity for employment and as a method preparation for future positions. The metrics associated with the project could also help with program assessment. Jennifer Sadler, a former digital strategist for the Commercial Appeal, teaches multimedia journalism as part of the Integrated Marketing Communications program at Ole Miss.